I have been so busy and tired. I have 3 exams this week. Doing this post is my break/relaxing from studying. On another thought, the weather here has been so good. It felt like spring is actually surfacing ;) I can't wait for spring/spring break. Ok, I think I need some sleep, but I am going to try to study for one more hour that's if I don't fall asleep on my books lol! The only relaxing time that I have had yet is watching Gossip Girls. Did anybody see tonight's episode? Thoughts? i prefer the first picture, the second one is out of my extended comfort zone. outfits. My dear, I love your skirt! I love that second look! So effortlessly chic! I love the skirt in your first picture! wishing you all the best with your exams sweetie! im lovin the second look! just put it on and go! luv your style! u should be on lookbook! wishing you a gorge wknd ahead. 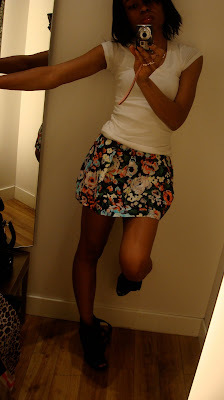 OMG love the floral skirt. I love H&M. they rule! my friend has the white striped shirt. She rocks it too! she styled it with a brown belt and lace stockings. and long over the kneww brown boots!